Pagosa Hour Exchange uses time credits as a convenient way to exchange services. 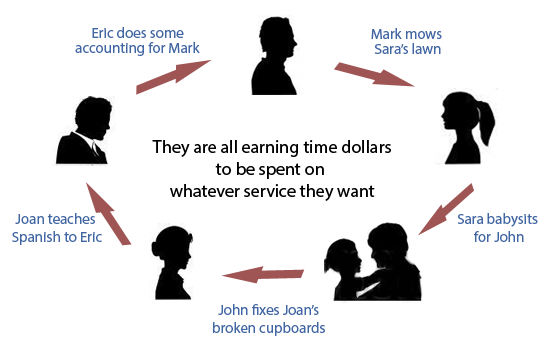 One hour you spend performing a service for someone earns you one time credit. You then spend the time credit you earned on services of your choice. For example, you could teach someone how to paint and use the hour time credit you received to get a massage. Upon becoming a member, you are given an account through the Time Banking website. With this account you can offer your list of services, search for the services you desire, record transactions, and log your time credits. Although it is true that some skills are perceived as having a higher value, Time Banking recognizes that everyone’s time is equal no matter what job they perform (thus time spent is time earned regardless of skill level). This mentality builds healthier relationships based on mutual respect and the understanding that to build a strong, generous community we need everyone’s contributions equally. This is how we transform the way we get our needs met and contribute to our world. Materials needed to complete a job (such as paint) will be supplied or paid for by the person requesting the painting service in most cases. As such, it is the responsibility of the person offering the service to converse with the person receiving the service to assess how much money the paint (or other products) will be. Please read thoroughly through our FAQs page.